Moonrakings is a new artisan and is located in the same building as Kootenay Forge and FireWorks Copper and Glass. (The Forge and Furnace Gallery). 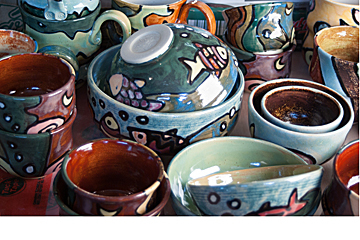 Owner Jacqueline Wedge has been working with clay for many years and has a definite style. She is also a very talented painter, and has paintings for sale as well as her pottery and other clay art.